A bow to the hardworking people working on school lunch programs across America that made this top 10: Chef Ann Cooper, Alice Waters/Edible Schoolyard Project,and my pal Donna Cavato (along with April Neujean!) who fought mightily to create the New Orleans version right after Katrina, and the many other unsung heroes working to reconfigure this beast in systems large and small, public and private. 10 Best School Lunches in America (Slideshow) | Slideshow | The Daily Meal. Although this is a vital article on the breadth of the problems and issues that face the fight for the farm bill, I hesitate to wrap the entire alternative food and farming movement inside of a crisis, even one that is so monumental like public health. In my mind, our work is powered by the most diverse set of ideas and goals captured by the simple exchange of food regionally grown, caught or made by hand. Rural, peri-urban and urban uses of land, water issues, transportation systems, safeguarding import-replacing production, creation and preservation of public space and stewardship of private land for farming and social activities, anti-hunger campaigns, appropriate technology, hands-on education for children, democratic distribution, encouraging multi-generational understanding, fighting corporate control of food, unique approaches to wealth creation, celebrating current culture and reviving food history, job creation, worker rights, immigrant issues, disaster mitigation, attacking institutional and individual racism, supporting personal health goals, sharing intellectual ideas without need of institutions to shepherd it, expanding civic activity, …. In other words, remember that we are pirate ships and not an armada. I know that many will say that all or most of the items above can be encapsulated within public health, but to me, the diversity of how each of us approach this is our greatest strength. I agree with Michael on the end goal, but I prefer to say it like this: we sail alone, but need to anchor together at times like this for this historic farm bill fight. So, when some or most of these good ideas can be brought into a single campaign by folks like the public health sector, we need to welcome them and maybe even let them lead for a while. Can Public Health Unite the Good Food Movement? | Civil Eats. This is one of my favorite food system sites . Wouldn’t it be great if each state and every regional projects collected and shared this type of visual data? A screen shot of the Maryland Food System Map circa July 2013. Map updates include expanded Nutrition Assistance data and updated points of interest for Maryland. Nutrition Assistance – new and updated data about federal nutrition assistance programs. Points of Interest – updated points of interest note changes in addresses and expand lists statewide. 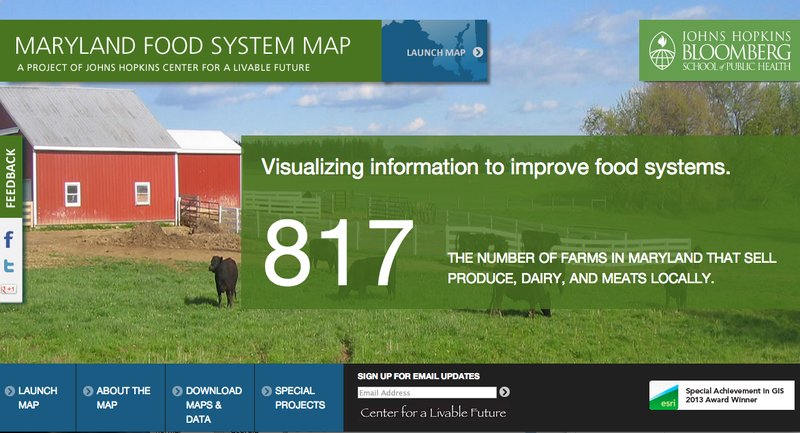 Maryland Food System Map | Center for a Livable Future. Farm to School Programs Get a Boost | Care2 Healthy Living.